Emperor Vikramaditya of Ujjain (city originally named as Ambavati) lived during 101 BCE – 19 CE based Jyotirvidabharana of Kalisada, Jyotishaphala Ratnamala of Krishna Misra, history of Nepal, Kashmir, Stapatha Brahmana, Bhavishya Purana. This king is considered legend, while he is actually part of history and even referred in Puranas. Few vedic astrology books written during his time prove his existence in 1st century BCE. Vikrama Saka (era) followed in vedic panchangs since 57 BCE as Vikram Samvat. Famous poet Kalidasa, Astrologer Varaha Mihira were among the 9 gems in his court. Kalhana‘s Rajatarangini (river of Kings), Vikramditya’s contemporary Krishna Misra’s astrology book Jyotishaphala-Ratnamala, few mentions in Bhavishya Purana, recorded history of Nepal prove his existence with correct dates and years. Translation : At the completion of 3000 years after the advent of the terrible Kaliyuga, (ie.101 BCE.) a person descended from the abode of Guhyakas in Kailasa, at the command of Lord Siva, for the purpose of destroying the Sakas and uplifting Arya-Dharma. He was born to the Great King Gandharvasena. The father named him ‘Vikramaditya’ and felt very much rejoiced. Though aboy he was very wise and pleased his parents. When he was 5 years old, Vikrama went to the forest and did penance for 12 years. Having enriched his greatness by penance he reached the city Ambavati (Ujjain) and was anointed as a king on a golden throne decorated with 32 golden dolls. Translation : This verse from Bhavishya Purana states that, in the west the other bank of the Sindhu River; in the South the Setu; Badarinarayana in the Himalayas formed the North limit and the city of Kapilavastu, the boundary in the East. 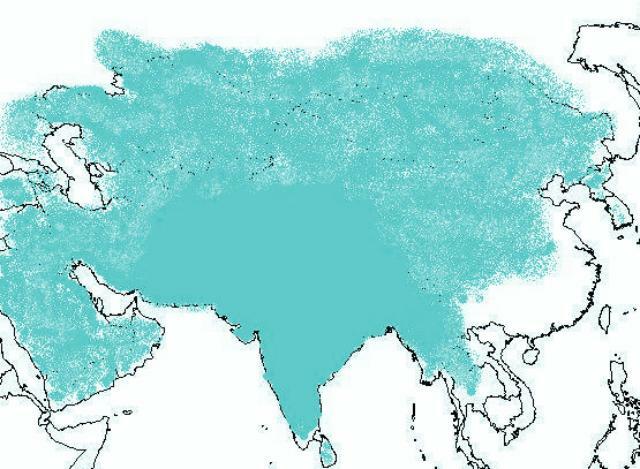 These were the limits of Vikramaditya’s Empire. There are other instances which prove that he travelled beyond these borderd later to conquer other kingdoms. Salivahana established his own Saka in 78 CE, which is followed even today in most parts of India and years in panchang (vedic almanac) known as Saka Samvat or Shaka Samvat. Paramara dynasty continued to rule Ujjain, which ended in 1305 CE, whose last king was Mahakaladeva. One sloka in bhavishya purana mentions that Devabhakta knew that his killer was born and traced him to be in Pratishtana (modern day Paithan in maharashtra). In a war, Devabhakta, after ruling for ten years, was killed in a battle by the cruel Sakas. (Kali 3130 or 29 CE). Victories of Babylon, Persia, Turks led Vikramaditya to the Arabia. When he conquered Arabia, he did so to cheers from the Jewish and Arab Community, who welcomed him as a liberator. He showed great forbearance and respect towards the religious beliefs and cultural traditions of other races. These qualities earned him the respect and homage of all the people over whom he ruled. The victory over Arabia expressed all the facets of the policy of conciliation which Vikramaditya had followed until then. He presented himself not as a conqueror, but a liberator and the legitimate successor to the crown. He took the title of “King of Aryavrata and Liberator of the Arabs, Turks and Jews”. Vikramditya had no thought of forcing conquered people into a single mould, and had the wisdom to leave unchanged the institution of each kingdom he attached to the Aryavrata Crown. 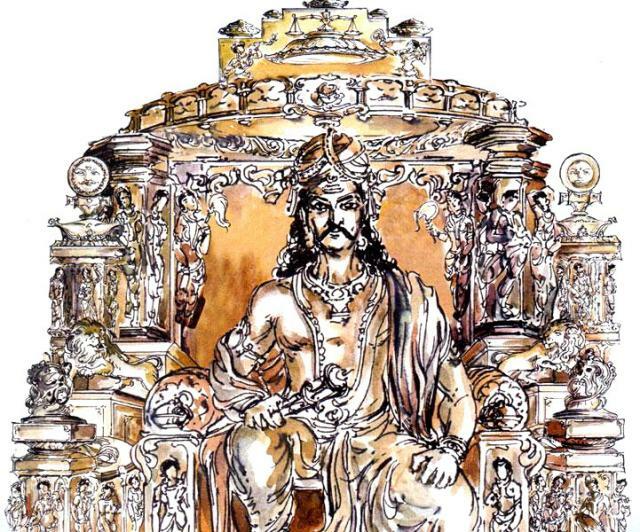 Vikramaditya was upright, a great leader of men, generous and benevolent. He spread the Vedic Culture in the land of Arabia. He also reconstructed the temple of Brahma and Mahesh and placed a Jiyotarlinga there. Several other Vedic Temples were made in Babylon, Persia and Turkistan. For the first time they got a King that cared for the inhabitants of his Empire. Arabs, Kurds and Persians saw him as ‘the annointed of the Lord’. After the 4 year of Wars that saw whole west Asia under the belt of Vikramaditya Empire he stayed for a year in Arabia till the Mahadev Temple was not completely reconstructed. He built admirable highways, and developed an excellent postal system both of which allowed him to receive rapidly information from his provinces. He accepted Perisans as Aryans and called them as long lost cousins. During the Vikramaditya’s regions persians felt like they felt under the region of Cyrus. He also bulit several monuments in the respect of Chandargupta Maurya and Cyrus. Another project undertaken by Vikramaditya was the royal road, the world’s longest, extending 1,700 miles. Due to an extensive network of relays, postmen could travel the road in six to nine days, whereas normal travel time was three months. The motto of the Vedic postal service became memorable: stopped by neither snow, rain, heat or gloom of night. The US postal service also adopted this motto and the famous Pony Express mail delivery resembled the original Vedic design. Vikramaditya laid the foundation of Vardhan Dynasty. His empire controlled many parts of Modern day China, Entire Middle East and Many Parts of South East Asia. After his death his descendents and Parthians controlled Iran. By 102 CE descendents of Vikramaditya lost control over Iran and Parthians established there empire in Iran and Babylon. Jyotirvidabharana is an astrological work by Kalidasa. Kalidasa also defines the word Saka. He says that whoever kills large number of Sakas, will become Saka-Karaka. This book Jyotirvidabharana, says Kalidasa, he began to write in the month Vaisakha (around May) of 3068 Kali Era (or 33 BCE) and was completed in the month Kartika (around november) of the same year. In the beginning of the 22nd chapter Kalidasa described, to some extent, the Emperor Vikramaditya and in the 6th sloka he says that this book of 22 chapters and 1474 slokas is written with the purpose of invoking good to Vikramaditya, the Emperor of Bharat. 2. The Bharata-Varsha shines forth with the culture of the Vedas and Dharma Sastras. This book is dedicated for the good of Vikramaditya, the emporer of Malwa, by me (Kalidasa). In the 8th and 9th slokas of Chapter 22 Kalidasa gives a list of poets and pundits adorning the court of Vikrama. n 22-11 Kalidasa gives a further account of the court of Vikrama. There were 800 Vassal kings, one crore of good soldiers, 16 great scholars, 16 astrologers, 16 efficient doctors, 16 bhattas and 16 scholars of Vedik lore; Vikrama sitting on his throne was illuminated by these scholarly courtiers. 1. There were 3 crores of soldiers. 2. Ten crores of various vehicles. This was the army that accompanied him in his expeditions. In this respect there was no emperor to be compared to Vikrama in those days, says Kalidasa. Sloka 13 of the 22nd chapter says that Vikrama annihilated innumerable Sakas (who were Mlechcha Kshatriyas) and established the Era. Every day he made gifts of pearls, jems, gold, cow, horse, elepahnts to the four castes. Hence he was called “Suvarnaanana“. Sloka 16 of chapter 22 says that Ujjyini, the capital of Vikrama gives salvation to the inhabitants on account of the persence of Lord “Siva” in the name of ‘Mahakala‘. Sri Krishna Misra was in court of Vikramaditya for 70 years from 57 BCE, which means that the emperor lived atleast till 13 CE. Having consolidated his empire, Vikramarka went to Nepal; he made the king, Amsuvarma a feudatory, and as a symbol of his over-lordship founded his Saka in Nepal in 57 BCE. Another book Satapatha Brahmana, also mentions of Vikramaditya. of Vikramaditya, the king of Avanti, by name “Hari Swamy“, has written commentary or Bhashya to Satapatha Brahmana. In the year 3044 Kali or 57 BCE, Vikramaditya visited his vassal state Nepal and established his Era there (Vikrama Saka). This information is published in the Indian Antiquary Vol. XIII. Pages 411 onwards. A local legend in Ayodhya states that the city was re-discovered by Vikramaditya, after having been lost for centuries. Vikramaditya started searching for Ayodhya, and met Prayaga, the king of tirthas (Prayaga personified). Guided by Prayaga, Vikramaditya marked the place, but subsequently forgot its location. A yogi told him that he should let loose a cow and a calf: Ayodhya would be at the place where milk starts flowing from the cow’s udders. Using this advice, Vikramaditya managed to re-identify the site of ancient Ayodhya.